Want to play online poker on Ubuntu without having to download any software? If so, go for Poker Heaven instead. It's the best browser-based poker room I know, and it runs like a dream on Ubuntu. 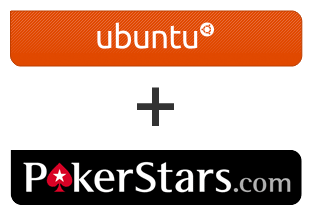 Download the Ubuntu compatible PokerStars client in preparation for the next few short steps. PokerStars is the biggest online poker room, but can you run PokerStars on Ubuntu? Yes, you can run PokerStars on Ubuntu. Awesome. However, PokerStars has not yet developed a downloadable client that is compatible with Ubuntu. Therefore, you will need to run PokerStars through a program that allows you to run Windows application on Ubuntu. It's very straightforward stuff really, so don't get too worried. How to run PokerStars on Ubuntu. Download PokerStars as normal and run it using the Wine program. Don't forget to use the PokerStars marketing code when creating an account. That's all you need to do to be able to run PokerStars on Ubuntu. Wine takes 2 minutes to install and after that you can install PokerStars as normal through Wine. Easy stuff. Wine allows to you run Windows applications on Ubuntu. It's an incredibly popular program amongst Ubuntu users and it's currently the only method for playing at PokerStars on Ubuntu. In fact, you can run pretty much any Windows application on Ubuntu using Wine, which is pretty handy if you enjoy your Windows-only programs. You can find out more about Wine on the WineHQ website. How well does PokerStars run on Ubuntu? PokerStars actually runs impressively well on Ubuntu using Wine. In fact, due to the high quality of the PokerStars client I have placed PokerStars as the top Ubuntu poker room. Some poker rooms can get a little buggy when being run using Wine as they have not been designed with the intention of being run on any OS (Operating System) other than Windows. PokerStars on the other hand runs incredibly smoothly. Furthermore, I have never had any problems making a deposit and playing for real money at PokerStars whilst running using Wine on Ubuntu. I have tested a number of downloadable poker rooms using Wine on Ubuntu and PokerStars is comfortably the smoothest. Will PokerStars bring out a true Ubuntu compatible client? I honestly don't know. However, if any poker room is going to develop a client that works on Ubuntu without using Wine it will be PokerStars. It's a bit weird that no online poker room has developed an Ubuntu compatible yet, but at least for now we can get rooms like PokerStars to run perfectly well using Wine. However, if PokerStars ever does bring out a client that works with Ubuntu I'll be sure to let you know. Go to the PokerStars review.